Nine weeks remain in the 10 week Thursday Thunder presented by Papa John's Pizza Legends and Bandolero racing series, ample time this season for drivers to put themselves in position to capture a division championship. All but eight competitors return to the quarter-mile "Thunder Ring" for week two action with plans of a better finish. The eight competitors who hope for a repeat finishing order this week found themselves in victory lane. For four of the drivers, it was their first trip to victory lane in their current division while a pair celebrated a Thursday Thunder win for the first time in their career. In his first race in the Semi-Pro division during Thursday Thunder after moving up from the Young Lions division, Sammy Smith of Johnston, Iowa started on the pole and held off Drew Dollar of Atlanta for the win. "That was a tough race," said Smith following his opening night victory. "Drew did a good job pressuring me. We were pretty even so it was pretty tough between us." Dollar started on the inside of the second row directly behind Smith to begin the race. In addition to Smith and Dollar, the Semi-Pro Division is shaping up to be one of the toughest battles of the season. DJ Canipe of Fallson, NC finished second on opening night and is the 2015 Bandits and 2016 Outlaws division champion and was a tie breaking second in the Young Lions division last year before he made the jump to Semi-Pro. Third place Davis Rochester was the highest finishing driver in the points standings from last year to return the Semi-Pro division this season. After coming up just a few positions short of a championship last year, Robbie Woodall of McDonough is looking for redemption this season and his first championship in the Masters division. He scored the victory on opening night as he was able to hold off Bill Plemons Jr. after taking an early lead on the first lap in the first feature race of the year. 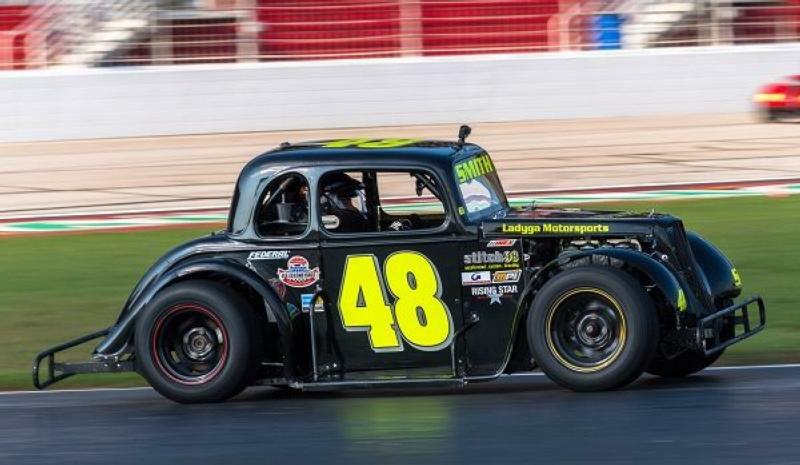 The oldest driver to win a race in Thursday Thunder competition at 69 years young, Plemons is also seeking his first points championship in the Masters Division. The Locust Grove native has earned ten wins in 73 career races in the series. Second year driver Ryan Rackley leads The Associates Group Young Lions points standings after an opening night victory in a caution filled race. "It was very difficult because it's always hard to keep on getting really good restarts," said Rackley. "It makes me calmer that I'm in the points lead and makes me relax and know that I can do what I can do." Rackley earned his first career Thursday Thunder victory last year in week seven action and finished seventh in the points standings. The Valdosta, Georgia native is first among all Georgia drivers in the national Young Lions Division points battle. In other divisions, Jensen Jorgensen of Stockbridge captured his 25th career win at Thursday Thunder and sits in first place in the VP Racing Fuels Pro division. Kenny Brady of Marietta scored his second career win in the GRT Racing Driver Development Outlaws division while Kelley Puckett of McDonough collected the win in the Bandits division. The 2018 season continues with week 2 action this Thursday, June 7 and will run each Thursday night through July 26, before wrapping up with a special-edition Saturday Championship Night on Aug. 4. Grandstand admission for the affordable, family-friendly Thursday Thunder Legends Series Presented by Papa John's Pizza cost just $5 per person, with kids 5 and under admitted free. For more information about both Friday Night Drags and Thursday Thunder, contact the Atlanta Motor Speedway ticket office at (770) 946-4211, (877) 9-AMS-TIX or visit www.atlantamotorspeedway.com.